Rosemary is one of the common culinary herbs that makes your meals tasty and is native to the Middle East region. It is used in cooked meals, sauces and on meats and flourishes in the mild climates of the world. When on sale, it can be in the dried or fresh state. Rosemary is easy to grow in a variety of ways; in plants, pots and easily swayed to align as a topiary shaped plant. When not available in the fresh form, the dried alternative gets handy while other substitutes can be used as well. Most herbs have their distinctive features and when not available as commonly preferred the dried option might come in handy. However, in some cases, the dried option might not make the cut. If you are cooking a meal that needs fresh rosemary for the desired outcome and you only have the dried one, then you will be better placed to use what is available. To successfully substitute dried for fresh rosemary, make sure that where you would have used a teaspoon of fresh rosemary, a quarter will suffice. In this regard, you end up with the distinct taste expected with the inclusion of the rosemary flavor. Outside of the form difference, the same contents that are found in fresh rosemary are also present in the dry option. Depending on where you live, you can buy dry rosemary at Tescos or your local grocery store. Some herb stores are also available online, and you can order your desired quantity, and they will be delivered to you. Rosemary is used to regularizing high blood pressure, treat dyspepsia and rheumatism. Its oil content is used for menstrual flow regularizing, cosmetic ingredients and to check baldness and stimulate hair growth. It enhances the production of enzymes that detoxifies reactive substances. Thyme belongs to the mint plant family and is an attractive herb with a plethora of flowers that appear lilac, pink or white. Their aroma evokes memories of caraway, eucalyptus or lemon. Thyme is well reviewed as a cooking ingredient and is chopped dried or fresh for sale and use in meals as casseroles flavor, soup seasoning or even as sautéed vegetables. It can be used to enhance the taste of fish, meat, bandish or eggs just by applying a sparkling.Half to a quarter teaspoon full of thyme in diced form is used in meat seasoning and eggs scrambling to give the desired taste. Thyme is easily bought at the local grocery store and can also be ordered from specialty herb stores online for personal or desired use. Irrespective of where you live, any of these sources are easy to access so that you get the thyme you need in the form suitable for your use. Thyme is on of the contents deployed for the production of cosmetics, perfume, soaps and antibacterial remedies. As an herbal remedy, it is antiseptic and antimicrobial, making it an added ingredient in acne remedied and other clinical processes. It is also regarded as an anti-inflammatory remedy and thought of as useful in cancer management. Tarragon is known for its intense flavor and therefore a veritable option to rosemary when you are preparing a recipe that is in dire need of some spice. It belongs to the sunflower family and is a perennial herb found naturally in North America and across Eurasia. It is rich in fragrance and to be preferred when sources fresh for desired effects. It is commonly used in French recipes and essential for the preparation of the Béarnaise sauce. Applied in a quarter of a cup proportion when fresh or one teaspoon in a dried state, it is used for chicken seasoning, cooking of fish, other poultry, and cheese and along with onions and mustard for soup recipes. Tarragon is best bought in small portions and chopped for storage in the vegetable compartment of fridges when needed.Extended storage is ill-advised, so it does not lose its tinge. Fresh tarragon needs washing before use, and this should be immediate before use so that it can retain its taste and flavor. Tarragon is thought of as a stimulant for appetite and to alleviate symptoms from anorexia. It is also considered as effective for blood-sugar level reduction and as an antioxidant.As a herb, it is rich in vitamins with an appreciable concentration of a, b, and c –complexes as well as magnesium, Iron, calcium, and copper. Winter and summer savory are well known as the common occurrence of this herb and is used as a rosemary substitute as a result of its piquancy. It adds the tasty edge to meals and makes mild foods come to life. It is native to South EasternEurope, and its flavor is known to blossom during the period of its cultivation. Its pungency is likened to that of thyme. The summer savory is a constituent of the regular blend for casseroles and the banquet gam delicacy. It is used in scrambled eggs as chopped additives or with parsley as a garnish. It features in slow-cooked meals, seasoning for vegetable﻿s and as a palate-blast for beans and lentils. It is used in a variety of sauces and meals as a fitting seasoning. Winter savory is employed in pinches during the cold months as the condiment and is popular across Bulgaria. The storage of savory is often cut and dried in summer to flavor meals and stored in jars when winter calls. Since it stores favorably with little or no loss of tinge, it can be preserved until the next summer and used when needed. Fresh summer calls for emptying of the jars as summer savory will be in season. They are available in both dried and ground form in local grocery shops and through online herbal stores. Summer Savory is used as a powerful form of antiseptic with its strong aroma coming to reckoning. When tossed into the fire, it suffuses the atmosphere and acts as a disinfectant. It is effective as ingredients in soaps and toothpaste.Volatile oils are active compounds found in savory and are effective for diarrhea; it is used by some to gargle and relieve sore throats, treat indigestion and other forms of flatulence. Caraway seed is another rosemary substitute that compliments other ingredients used for the preparation of your meal. It is native to the central regions of Europe but has spread to such places the Middle East and the Mediterranean. They are aromatic, and their anise flavor is clearly distinctive. Though they occur as tiny bits, their pungency makes their use limited to teaspoons or less. The caraway seed effect is seen in sausages and in most meals where the strong effect of seasonings desired / they belong to the carrot family, and their use is not limited to the seeds as their roots are also edible. They can be sued in salads, pork roast, and poached fish as well as in Polish sausage meals. They fit well into a variety of other dishes where their spicy bent ends up as an enlivener. Caraway seeds are thought to be effective as rich in dietary fiber and selenium, Potassium, copper, and magnesium. They red blood cells formations, aid digestion, regulates body growth and development and fight against neurological diseases and cancers.They are rich in vitamins A, E, C and other complexes that aid physiological functions. Marjoram is rosemary substitute that ha sweet, aromatic flavor and is s related to oregano. Its use in seen in a variety of cuisines and is natural to Mediterranean vegetation. It is a vital ingredient in many Italian and French sauces as other Northern Europe sauces. It is commonly used in mushroom diets as a delicious seasoning and some instance where rosemary is present; it is added for more bite. It is best added to meals when the cooling is almost completed so it can retain its spiciness. Commonly added to herbaceous dishes like veritable and tomato delights, it can be formidable in homemade dressings. It is rated as low in sodium and saturated fats as well as cholesterol. It is rich in dietary fiber as well as vitamin c, k, and b6. It supplies folates, calcium, manganese, and magnesium. It is also useful as anti-oxidants, analgesic and improves cardiovascular conditions. For skincare, it fights skin wrinkling, acne, and eczema. .it also boasts of antiviral, antibacterial and antispasmodic properties. Bay leaf is another rosemary substitute that is known for its pleasant aroma and is well renowned for its culinary benefits. It is native to AsiaMinor but has spread to other parts of Mediterranean and fringes of Asia. This dark-green bay leaf is a meal delight that features well in any lamb dish along with peppermint and thyme. Fresh use of bay leaves is recommended and sometimes after been left in the sun for the bitter flavor to get wilted. The pleasant aroma is retained after exposure to the sun, and it can feature in some other dishes as well. Bay leaf is rich in calcium, copper, manganese, selenium, and magnesium. It is an excellent component for the formation of cell development and optimal body fluid optimization. It is also rich in Iron and activates enzymes in the desired quantities. They have medicinal properties that well reviewed for their digestive influences and respiratory system enhancement. They spur hair growth, fight oxidation and are effective for management of diabetes. 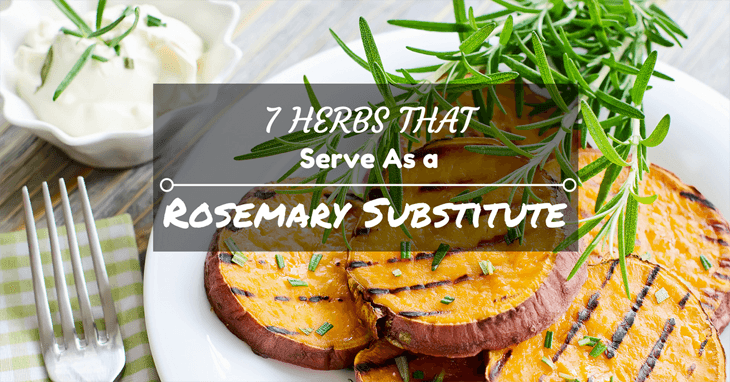 Rosemary substitutes like caraway seeds, thyme, bay leaf, marjoram, and tarragon are nutritious and medicinal with proven health enhancement benefits. If you have gone through this page with keen interest, feel free to leave your comments and observations on this page. You can share this page with friends and let them know what you have learned.